On October 22, 1936, exactly 75 years ago, President Largo Caballero signed the decree which brought into existence the International Brigades. 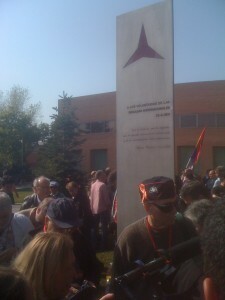 Today, several hundred people, including four IB veterans, three representatives of ALBA, and a considerable contingent of Friends and Family of the Abraham Lincoln Brigade, attended the inauguration of a monument to the International Brigades, on the campus of the Complutense University, in Ciudad Universitaria, where many of the earliest volunteers saw their first combat action. It is with a deep sense of honour and gratitude that I am here today. It is an honour because today we remember all those young men and women who came to Spain to join the anti-fascist war. Sadly for the Spanish people, we lost that fight, though the fascist powers were defeated in the World War that followed the Spanish Civil War. We must not forget the many thousands of international volunteers who died on battlefields in this beautiful country. Nor can we forget the terrible suffering of the Spanish people. We lost the war in Spain but the ideals of the international volunteers were not defeated. They live on today. Today we must still strive for international solidarity and social justice. And we must oppose fascist ideology in whatever form it takes, whether it is racism, anti-semitism, militarism or dictatorship. I speak also with gratitude because I want to thank the Asociación de Amigos de las Brigadas Internacionales and all those who have made this wonderful memorial possible. 75 years ago this month, the International Brigades arrived in this great city to defend it against a military coup launched with the support of Hitler and Mussolini. 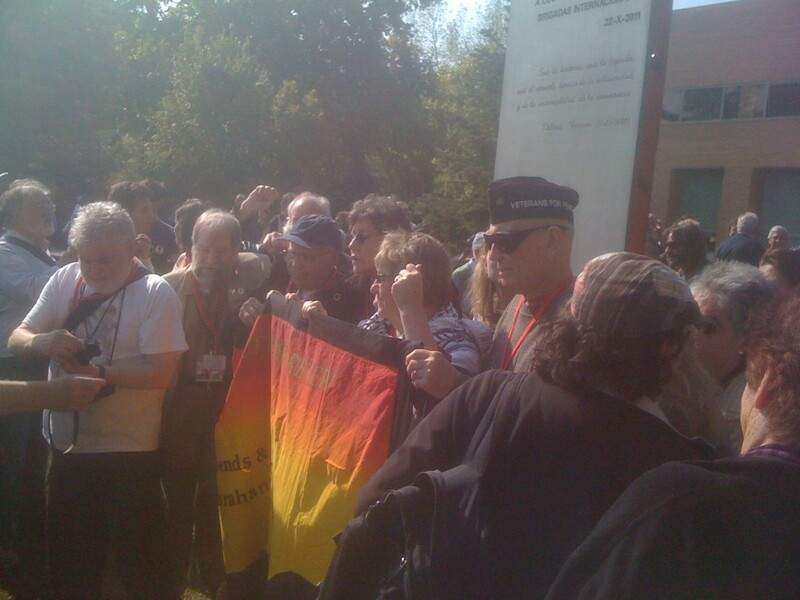 Today we remember those men and women who said that fascism shall not pass. I am sure that this new memorial will help teach future generations about our ideals. They were ideals of peace, democracy, freedom and anti-fascism. Our ideals live on today and they are still worth fighting for. Quite an emotional day, full of warmth and gratitute do the men and women who joined the International Brigades 75 years ago!